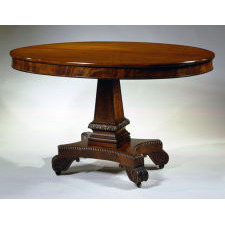 The fixed oval top with a shallow skirt above a central, paneled pylon-shaped standard with an acanthus-leaf collar and molded base, on a concave abacus plinth with spooling around the top edge, raised on carved volute-form feet with recessed caster wheels. Condition: Excellent: minor restoration to the bottom of the feet where they had sustained damage from the pivoting caster wheels, and minor restoration to veneer on the skirt caused by natural shrinkage to the top. The top has been re-finished with shellac in the manner of the period. All other surfaces have been waxed. The table base is almost identical to one on a card table bearing the ink stencil of Isaac Vose and Son in the collection of the Saint Louis Museum of Art. Thomas Seymour, after closing his own shop in 1818, became the shop foreman for the firm of Vose & Son, considered then and now to be the greatest makers of Classical furniture in Boston. This elite pairing of talent produced some of the finest furniture in America of the Classical period in the Regency taste. 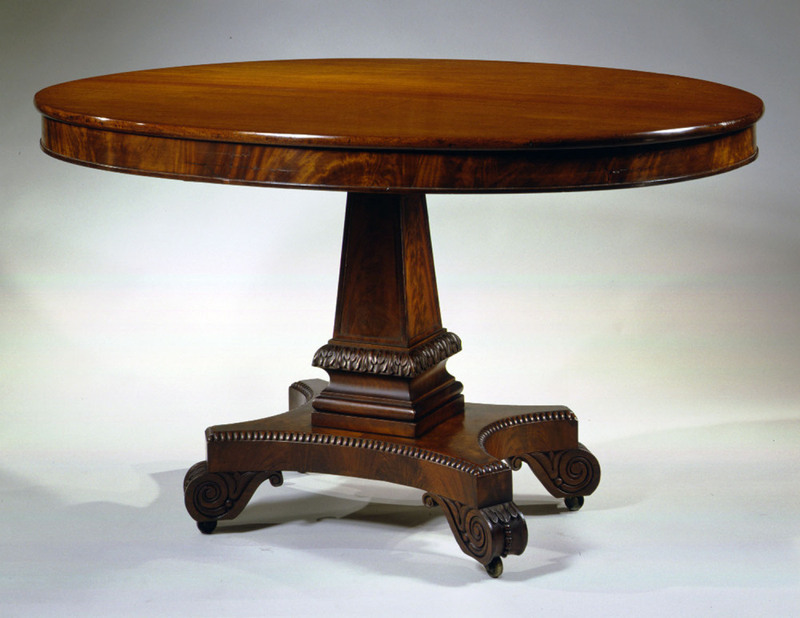 Robert Mussey has identified a pair of Grecian card tables with pylon pedestals and scrolled feet made by Seymour for Peter Chardon Brooks in 1816 as the prototypes for a group of tables, like the Saint Louis example, made a few years later with Vose. This table, clearly in the style of the documented Vose tables, has a leaner or narrower pylon than the Vose tables and is, as a result, more successful. Wendy A. Cooper, Classical Taste in America 1800-1840 (Baltimore Museum of Art, 1993), 134. Robert D. Mussey, Jr., The Furniture Masterworks of John & Thomas Seymour (Salem: Peabody Essex Museum, 2003), 360, pl. 113.